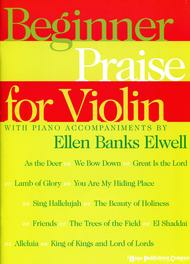 Beginner Praise For violin arranged by Ellen Elwell. For Solo Violin, Piano. This edition: Complete. Collection. Sacred, General. Instrumental Book. Published by Hope Publishing Company (HP.1781).Easy accompaniment of Praise & Worship songs with a pull-out section for the violinist. Very easy.